My friend Felix from Munich frequently impresses guests with his delicious Flammkuchen, a type of German flatbread with a delicious sour cream, bacon and onion topping. He provided all his Flammkuchen baking insight to me yesterday, so what better way to finish a long week than unwinding with a freshly baked Flammkuchen and a nice glass of Austrian Weißburgunder, watching a movie on the couch wrapped in a cosy blanket – or dressed in one of these (who knew that Tart Flambée T-Shirts were a thing??!). 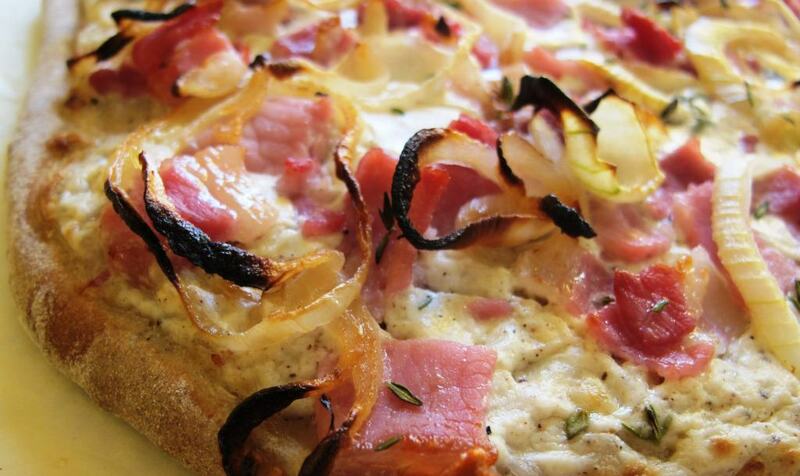 Here is his Flammkuchen recipe for all of you to enjoy! 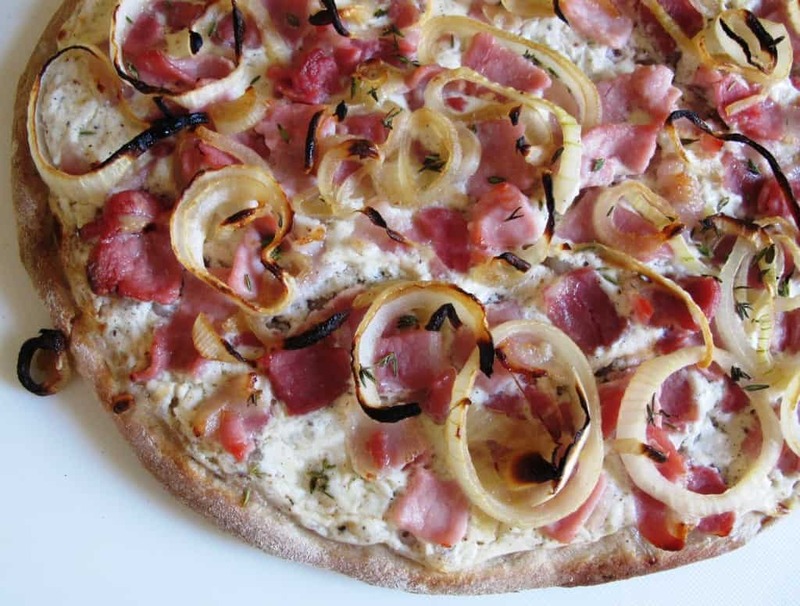 Flammkuchen (or Tarte Flambée in French) is an Alsatian dish – it’s easy to make and you’ll only need a few ingredients. 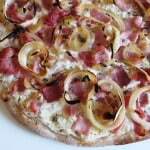 The traditional Flammkuchen toppings are sour cream (Felix recommends crème fraiche as it’s thicker), onions and bacon. I’m planning to experiment with different toppings, but to start with, I go all traditional on this recipe. Before I jump into the Flammkuchen recipe instructions, a few additional notes on what Flammkuchen is and what it’s not. Flammkuchen is often referred to as ‘German pizza’, so I just wanted to set the record straight on this one. Flammkuchen and pizza use the same base dough. The key difference is that Flammkuchen uses a base of sour cream or crème fraiche while pizza comes with tomato sauce. Flammkuchen is also not to be confused with white pizza which is pizza with a cheese base. Cheese is not traditionally used as a topping for Flammkuchen and the bread dough crust is generally thinner when compared to pizza. And… the Flammkuchen shape is usually rectangular or oval rather than round as it is for pizza. This delicious Flammkuchen recipe is easy to prepare and rewards your work with delicious flavours. The quantities below are for 4 portions. Combine all dough ingredients in a large bowl to form a rough dough. 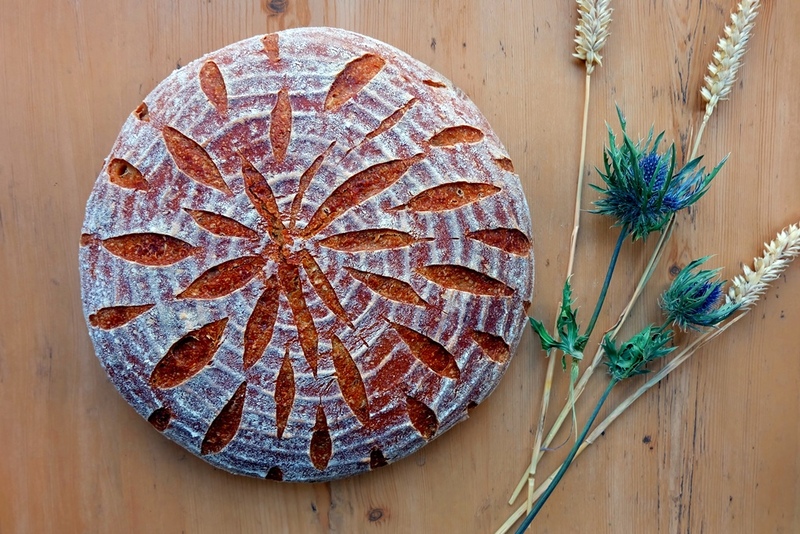 Knead the dough for 10 minutes until you have a smooth, elastic, stretchy and velvety dough. Place the dough back into your bowl and cover with a lid. Leave to rest for 2 - 4 hours at room temperature (or overnight in the fridge). Preheat the oven and a baking tray to 250°C (the highest temperature possible) 30 minutes before the bake. If you have a pizza stone, preheat the oven and the pizza stone 1 hour before. Divide the dough into 4 parts (8 parts for smaller sized Flammkuchen). I use a dough scraper to do this. Shape each part into a ball and leave to rest for 10 minutes. Combine the crème fraiche and yoghurt in a small bowl, add the nutmeg, salt and pepper and mix well. Roll out the dough pieces (2-3 mm) and transfer to baking sheets. Leave to rest for 15 minutes. Fry the bacon strips briefly until almost cooked, don't let them get crispy. Fry the onion rings in the same pan until slightly browned. If you are making all 4 Flammkuchen but baking only one at a time, don't add the topping to all of them at once. One by one works better as the topping doesn't melt into the dough that way. Evenly and generously spread the cream mixture onto the dough (you want a really thick coating in order for the finished product not to be too dry), leave a small border around the edge (this will turn golden-brown and crispy). Scatter the onion rings and bacon on top and sprinkle with thyme. Bake for about 12 minutes or until the edges are nicely browned and the bottom is crisp. If you have leftover dough, you can refrigerate this in cling film and bake more Flammkuchen the next day. If baking the next day is not an option, you can freeze it too. Roll out the dough into a base and par-bake (for about 3 mins). It needs to be fully cooled before you freeze it. When you feel like a cheeky Flammkuchen, simply take out the base, add the topping and bake again. Hope you enjoy this Flammkuchen recipe as much as I do, it’s perfect for a night in!